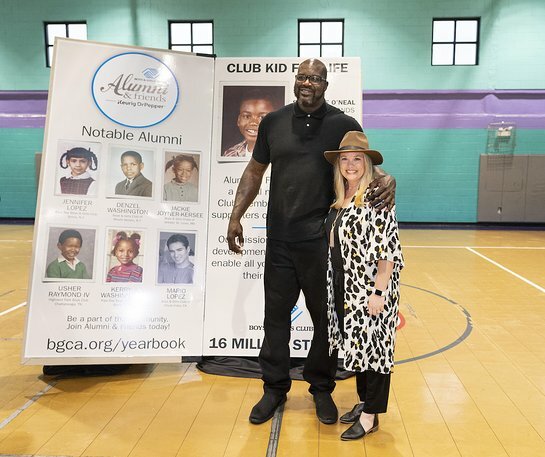 Boys & Girls Clubs of America and Club alum Shaquille O’Neal announced the winner of the Alumni & Friends Yearbook contest during an event this week in Downtown Atlanta. Sarah Hernandez, who started her Club experience at the Boys & Girls Club of Vernon in Vernon, Texas, won the contest – earning $10,000 for a Boys & Girls Club of her choice and the chance to meet Shaquille O’Neal in Atlanta. The special event held at The Salvation Army Boys & Girls Clubs of Greater Atlanta Fuqua Unit featured nearly 100 Club members and Club alumni who came to help celebrate Hernandez’s opportunity to meet O’Neal. Hernandez not only grew up in the Club but she is now the CEO of the Club she attended growing up. After a personal meet and greet between O’Neal and Hernandez, O’Neal was greeted by a massive eight-foot, 100-pound yearbook filled with other notable Club alum and his own personal page. Alongside Hernandez, O’Neil spoke with graduating teens and Club alumni about the importance of returning back to Club to give back. Launched in May 2018, Boys & Girls Clubs Alumni & Friends Yearbook was created as a platform for alumni to reconnect with fellow Club kids, share stories about their Boys & Girls Club experiences and make new connections with alumni across the country. The contest was created to encourage Alumni to participate and connect. Boys & Girls Clubs estimates that there are nearly 16 million living Club alumni, including celebrities like Denzel Washington, Misty Copeland and Shaquille O’Neal. These alumni and many others come from all walks of life but share a common bond through their Boys & Girls Club experience. Although the contest is over, participants can still sign the yearbook at bgca.org/yearbook. Thanks to Keurig Dr Pepper, the presenting sponsor of Alumni & Friends, Boys & Girls Clubs of America is creating a network of passionate Club Alumni & Friends who can support and provide mentorship to current Club members and other alumni. By reconnecting with the Boys & Girls Club community through Alumni & Friends, former Club kids and supporters can also be powerful advocates for Clubs and the kids and communities they serve. Boys & Girls Clubs continues to have a major impact on its members past graduation, with more than 54 percent of Boys & Girls Club alumni say the Club saved their life. For more information on Boys & Girls Clubs Alumni & Friends, go to www.bgca.org/alumni.